The Geese and Fountain is open for breakfast every day between 8.30am and 10.30am, and on Saturdays we carry on serving breakfast right through until midday. We love breakfasts – and a traditional full English breakfast is the perfect start to a day in the countryside. So whether you’re heading for a day at work, a ten-mile hike, a bike ride or just a lazy day in front of the TV, set it up right with a breakfast at the Geese and Fountain. 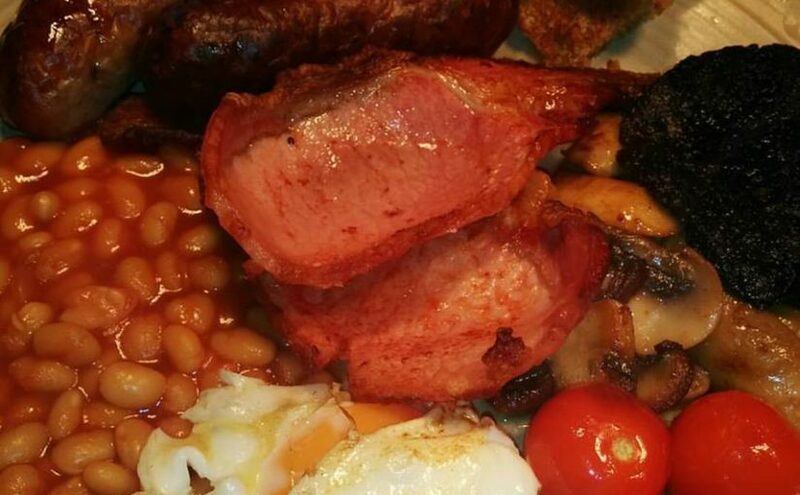 We serve a selection of cooked breakfasts, including our famous “Croxton Farmer’s Breakfast” (two local free range eggs, two rashers of Ancaster Butchers’ smoked back bacon, two David Cox sausages, cherry tomatoes, mushrooms, baked beans, black pudding and fried bread), porridge with Belvoir Ridge double cream, and toast with a selection of home made jams and marmalades. 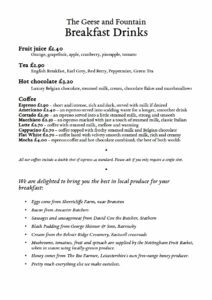 Whether you like your eggs fried, boiled, poached or scrambled, we’ve got the tastiest free-range eggs in the Vale of Belvoir, delivered fresh from Sherricliffe Farm, just a few miles away from the pub. And even if you’re in a rush, we’ve got you covered: we can pack up an egg, bacon and sausage sandwich for you – with Heinz tomato ketchup or HP sauce, of course! We also make our very own breakfast square muffins (or “squffins”), which can be topped with your choice of eggs, bacon, sausage and cheese, or served with eggs Benedict, Florentine, or Hemingway. There are also some healthy breakfast options – we love a bowl of fresh fruit, served with yoghurt, honey and our own crumble topping. And of course, you can wash it all down with our delicious teas and coffees, blended and roasted for us by St Martin’s Coffee Roasters in Leicester. 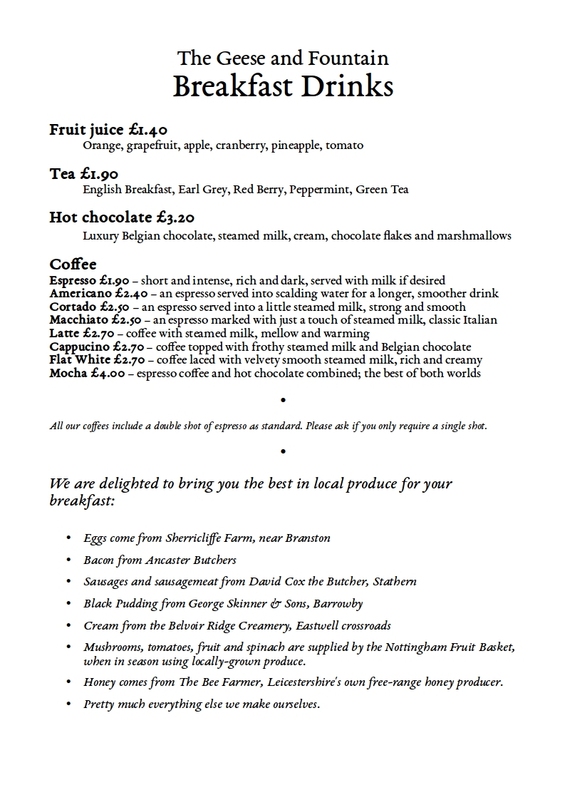 Have a look at the breakfast menu… and have a good morning!